The Pleasure Point neighborhood in Santa Cruz is a stretch of coast near Capitola that roughly covers the area of between 30th Avenue and 41st Avenue. Pleasure Point has a rightly deserved reputation as a surfing destination, due mainly to the great surf breaks and the local surf history associated with the spot. There’s a distinctively cozy beachside feel in Pleasure Point that captures the laid back surfing vibe perfectly, casually indicating the yes, this is indeed a surfer’s paradise. Nearby Capitola has plenty of shopping, dining, and coffee shops, all within a short distance from Pleasure Point. Though it doesn’t cover a large area, Pleasure Point does still have many of the same type of events and activities that you’ll find in other parts of the county such as Third Thursday and the Pleasure Point Street Fair. If there’s one thing that Pleasure Point is known for, it’s the well-deserved reputation as one of the best places to surf in Santa Cruz County. 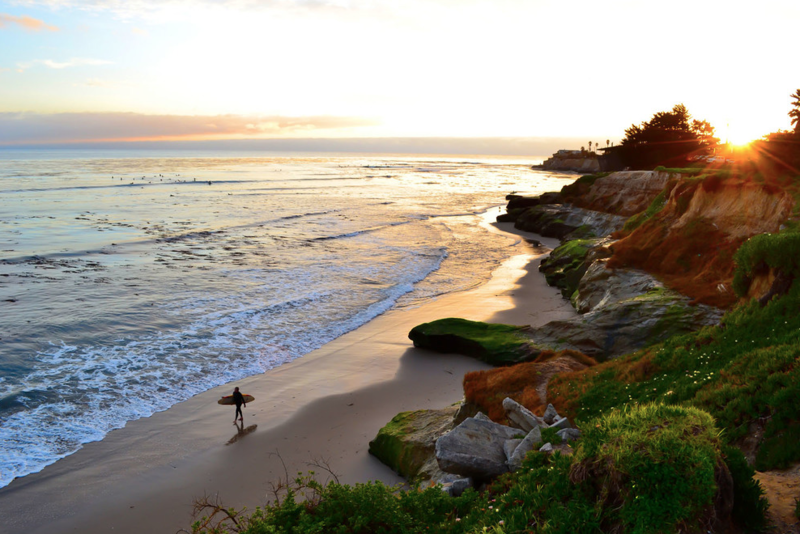 With multiple surf breaks that draw crowds from all over, both in the water and out of it, Pleasure Point is one of the ultimate places to soak up Santa Cruz surf culture. Part of the reason it’s such a renowned surfing destination are the great breaks around the Pleasure Point. There are several options in the area with 30th Avenue and the Hook being among the most famous. Of course, you can’t talk about Santa Cruz surf culture or Pleasure Point without mentioning the presence and contributions of Jack O’Neill (see below). Pleasure Point isn’t just one of the top local surfing destinations in Santa Cruz County, it’s also an area that’s rich in surfing history, largely because of the presence and influence of wetsuit inventor, Jack O’Neill. Prior to his passing, O’neill lived in his locally famous green house overlooking the surf break at 38th Avenue. It’s no coincidence that our local surf icon made the place his home—it was one of his favorite places to surf and, in his later years, watching other surfers was one of his favorite activities. Pleasure Point beach is located off East Cliff Drive, a set of stairs takes you down to the bottom of the bluff where, depending on the tide, you’ll find a sunny slice of sandy heaven. The beach is dog friendly and also has tide pools to explore. what's my pleasure point home worth?